The iconic building on Station Road in Edenbridge, built in 1934, is in desperate need of your support. Managed by the Edenbridge Town Village Hall Charity Committee, members are looking for help in raising £50k in order to bring the building into the 21st Century. The committee are already busy applying for funding from as many places as they can and while the amount they want to raise is a tall order, they believe it is achievable in order to save this fantastic facility that has been serving the community for many years. The main work that the committee want to get cracking on with is updating the inside of the hall as it can get very cold during the winter months for hall users and installing new PVCu windows, ceiling and roof insulation, new tiles and full redecoration would improve the temperature, making it a warm and inviting facility. It is a facility that is well used on a regular basis and it would be difficult to find many residents who have not been to at least one event in the hall during their time in the town. 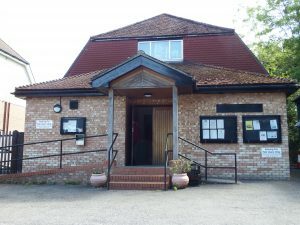 It is home to many clubs and organisations including Eden Nursery, Edenbridge Players, Forge Singers and fitness and dance classes as well as the many community events that take place such as quiz nights, live music nights and private parties. The main hall can accommodate a closely seated audience of 150 or for events which include tables about 120. The adjoining kitchen is equipped with fridge freezer, commercial dishwasher and a full range of cutlery and crockery. Hire of the hall and facilities is managed by Edenbridge Town Council who are very supportive of the committee’s plans for improvements to the hall. If you’d like to help support your local village hall, private and corporate donations would be extremely welcome to ensure this wonderful asset remains in the community. Please contact Jim Burbridge on 01732 866 787 to find out how you can donate.